Robert Smithson, whose prolific writings and early death in 1973 contributed to his postmortem presence as a figure meriting cult-like adoration among a generation of art students and critics, has again inspired a host of new discussion with the recent retrospective of his work, originating at MOCA last year and currently on view at the Whitney. Appropriately, Harrell Fletcher launched week two of Taking Place last Monday with a "cover" performance of Smithson's slide lecture on the Hotel Palenque. 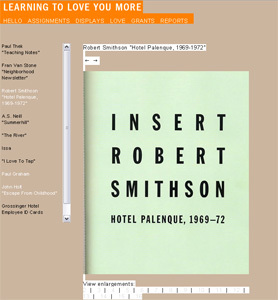 Smithson's well-documented lecture on the architectural highlights of a dilapidated hotel in Mexico was first given in front of a class of architecture students at the University of Utah in 1972 and lives on as both a transcript (published in Parkett several years ago) and an audio recording of the original lecture. Smithson details the decrepit spaces of the hotel, conceiving of the aesthetics of neglect in a mock-academic fashion. Although his offhand comments ludicrously elevate this crumbling hotel to monumental status, Smithson's fascination with entropy, monuments and contemporary ruins lend a certain ambiguity to the lecture, as the Hotel Palenque embodies the notion of a living contemporary ruin. Fletcher has presented Smithson's lecture several times and documentation of Smithson's piece is cited as part of Learning to Love You More, Fletcher's ongoing collaboration with Miranda July. Fletcher's interest in re-presenting this lecture is not surprising, since much of his artwork and collaborative ventures involve excavating art from everyday life. Throughout the lecture, Smithson lingers over such details as the "spiky, irregular, cantilevered effect" of rebar jutting out of a partially demolished wall; an empty chair in a deserted dance hall "suggesting the transitoriness of time and the universe" and also providing "a better view of the scaffolding in the roof"; and "the dried pool with the suspension bridge going across it." What did surprise me was Fletcher's insistence in the post-lecture chat that he was presenting the lecture in a neutral manner in order to allow the audience members to decide for themselves whether or not Smithson gave his slide presentation as a mockery of academia or a sincere tribute to these contemporary ruins. Fletcher read the lecture quickly and without intonation, and many of Smithson's spontaneous and humorous comments were lost because of this. While critics tend to note the tongue-in-cheek nature of the recording of Smithson's lecture, Fletcher, by "neutralizing" the piece, seemingly attempts to imbue the piece with newfound sincerity. It was disappointing that Fletcher so strongly disavowed his power to retranslate this piece either in terms of contemporary practice or within his own set of artistic vocabulary and the performance seemed to be no more than a nod to an art hero, perhaps a tribute better served by his inclusion of the transcript on the Learning to Love You More website. I somehow like this idea of someone 'covering' an artist's slide lecture. The Smithson show at MOCA last year was by far the best solo exhibition I've seen in the last few years and this slide lecture with a recording of Smithson was a revelation. Smithson's writings always seemed intentionally obscure but the audio component with the slide lecture really brought his focus on the "other" and the beauty of decadent decay home for me. Although, I didn't hear Harrell's lecture I think he was trying to summon some of Smithson's penchant for negation. call it a non-lecture as a riff on Smithson's "non-site"
Whether it was successful in the flesh or not I think conceptually it works because Fletcher is allowing Smithson's presence to be taken out of this key part of his ouvre. Still if someone is going to manifest an idea the manifestation should be held accountable for how it adds or decreases the richness of the idea that germinated it. In other cases some have tried to cover famous performance art pieces and it just comes off as pretentious and underdeveloped.... more like having one's picture taken next to a cardboard cutout of Acconci, Alys or Kosuth for their resume than anything with internal validity. Sure it can be "authentic", just like a cubic zirconia is an authentic c.z.... it's only purpose is to act as a cheaper imitation. I'm waiting for somebody to throw themselves out of a window to replicate Yves Klein... a similar adventure and record of something attempting to touch the nothing.